Text and images by Amy Christie for Design Mom. Tree illustrations by Eloise Renouf. 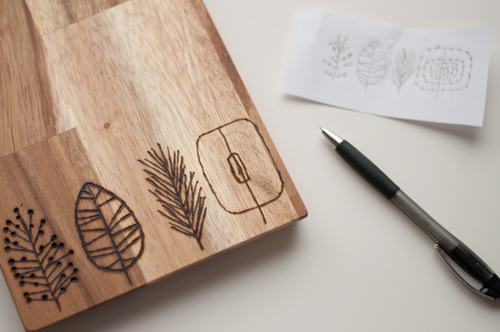 As I mentioned yesterday, I’ve created a 3 part series of cool gifts you can make with a wood-burning or etching tool. Today’s project: cutting boards! (Find the first project here.) 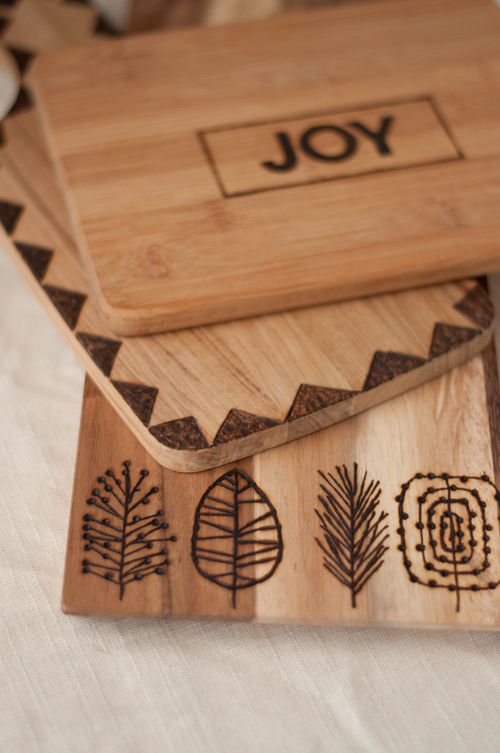 When the holiday season rolls around, I often wish I had a whole new collection of platters to set my table with, so I knew these etched cutting boards would make great gifts! 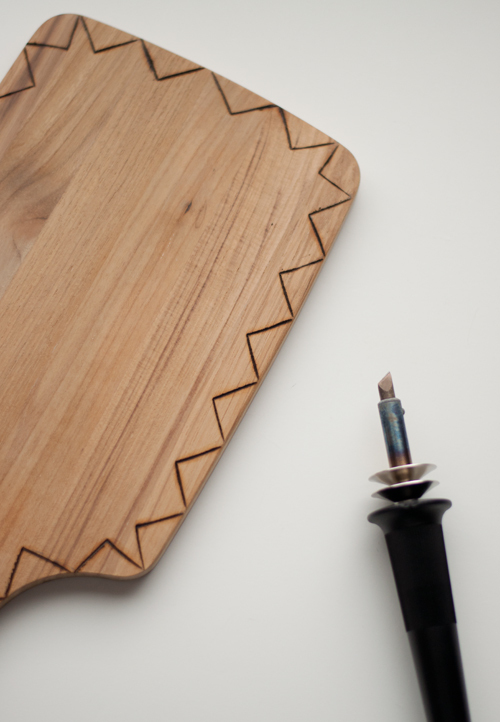 Just think, with a few strokes of a heat tool, wooden cutting boards can go from lacking to lovely. As you whip up a couple of these as gifts for friends and family, be sure to buy extras for yourself! Serving ware with an etched cutting board never looked this good. The technique is the same as it was for the spoons I shared yesterday, however the density of these cutting boards was different, more solid. The etching process changed for each board, but, as you can see, the result is the same. Adding a simple design really personalizes something store-bought. Ready for round two? Let’s go! – cutting boards, any size, shape, design. Note, I found etching on dark wood is nearly impossible to see. But if you have your heart set on a dark-toned board, give it a try. To add a word or phrase, type it up in your favorite font and print it out. Transfer the lettering onto the cutting board using transfer paper or by simply rubbing a pencil on the backside and then tracing around the letters. You could use a family name (wouldn’t that make a neat wedding gift? ), a holiday message or a favorite word or phrase. Maybe a more graphic design is your style. I repeated triangles around the outside of this little handled board after being inspired by this image. Outlining works but filling them in is also a really cool effect. Doodles works just as well. I was inspired by these tree sketches by Eloise Renouf and drew them on the board surface free hand, then burned them in place. Please note, if you have plans to sell these boards, you’ll need to create or commission original illustrations. Do these get you inspired? I hope so! 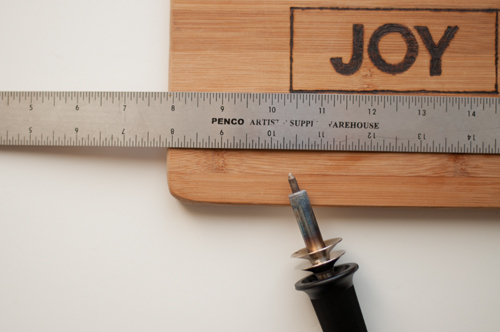 If you make your own etched cutting board, I’d love to see a photo. Happy gift making! – A personalized wedding gift. – A birthday gift for a foodie. – A Mother’s Day gift. P.S. — Do you like giving handmade gifts? Don’t miss our archive of great gift ideas! Previous Post « When Do You Crave A Beach Trip Most? ooh, I love those cutting boards (maybe even more than the spoons because the cutting board sometimes gets taken to the table to cut cheese or bread on. I think it would be so much fun to think up a design and create gifts like these boards. Love these! These would make great gifts for my husband to give to his coworkers. Question: Does burning it make small grooves that would be hard to clean after cutting meat or other things on it? I’d hate for it to not get fully cleaned and then be growing bacteria. It’s hard for m to tell from the photos how deep the burn is. Those look great, Amy! I especially like the one that says JOY on it. It just gets better! I love these. Can’t wait to see #3! Just a note to those worried about cleaning. 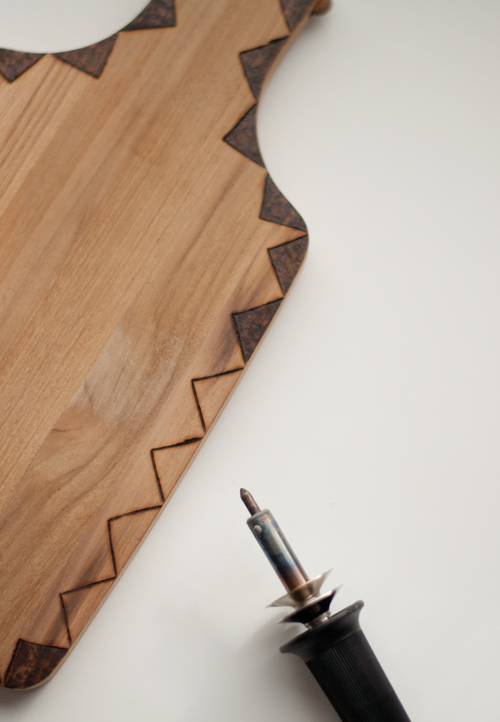 Treat wood cutting boards the same that you would treat a wood counter top. Seal with food grade oil, I like John Boo’s Butcher block oil. Then when cleaning after use, no soap! Use white vinegar! It is completely safe. Bleach and other products dry out and ruin wood. Love this! Just curious where you purchased your cutting boards from? Please credit Eloise Renouf for the illustrations! There’s a difference between being inspired by and copying!!! Thank you so much! I linked to the pin that featured the illustrations, but I couldn’t figure out who the illustrator was. I’ve been hoping someone would send me the name so I could properly credit the drawings. I’ll update the post right away. It’s been 5 years since this was posted, and I’m not sure if Rebecca will ever read this, but I feel compelled to comment on her rather rude and accusatory post above. Maybe you are not aware but Eloise Renouf makes a living not just by selling prints of her illustrations but by selling books, many books in fact, all of them focused on teaching people how to draw just like her. A search on Amazon will show it. What do you think is the purpose of her books if not having people draw like her? Mind you the owner of this blog did not claim the illustrations were hers, she practiced what Eloise has been teaching, and applied it on wood using a very different technique, which is rather creative. It is not expected or required by law that she mentions the places where she took inspiration from. She is not selling the products either, she is in fact providing a service to you too by teaching a DIY tutorial on how to etch on wood. I’m pretty sure Eloise would agree that having people draw inspiration from her drawings was exactly the point of publishing her numerous “how to draw” books. So, chill and don’t be rude to the owner of this blog. This design has copied Eloise Renouf’s design which is incredibly bad form unless you have contacted the artist first and asked permission. 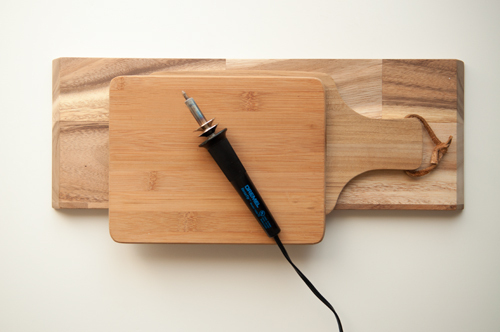 Very impressed with the wooden cutting boards…havs anyone come up with an idea for the plastic cutting boards…like how would one heat them enough to set the sharpie oil base pens if it were plastic…has anyone tried a microwave oven? I am exited to get into these ideas…Thanks for sharing them. Curious where I can find a good etching tool such as the one you used? I love the idea of creating a custom design in the wood. Like you mentioned, adding a custom design helps create something store bought into a great gift. If possible, having the wood cutter design a sample of what you are looking for would be helpful. Hello, after reading this amazing post i am also happy to share mmy know-how here with friends. Last Minute Gift Ideas | Friendswood. cartierlovejesduas I think this sounds delicious. I am going to make it for my family soon, and it might become our favorite summer food!